Mi Note 5 smartphone may be launched alongside the Mi 8 flagship and the MIUI 10 software at the event Xiaomi is hosting on May 31 in China. Successor to the Mi Note 3, the Mi Note 5 price and specifications have been leaked online, and even the Mi 8 launch event invite has been analysed deeply, which suggests Xiaomi may be launching more than one smartphone at the event. And even the Mi Note 5, Mi 8, and MIUI 10 may be accompanied by more products as the company is expected to launch more devices at the same event. While the Mi Band 3 has long been rumoured, there is a possibility of the launch of the Surge S2 SoC and a wireless charging pad. 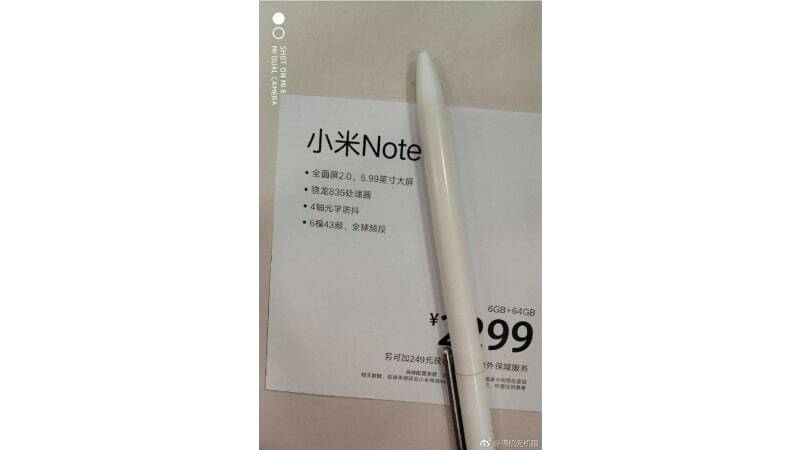 Starting with the Xiaomi Mi Note 5, promotional material of the upcoming handset has surfaced on Chinese media, as reported by GizChina. The material, which has been leaked through an image, reveals the specifications and features of the new Mi Note model. It suggests that the smartphone features a 5.99-inch display with a Full Screen 2.0 design – likely to sport ultra-thin bezels. The image also mentions the Snapdragon 835 SoC, coupled with 6GB of RAM and 64GB of onboard storage. Likewise, there is four-axis optical image stabilisation (OIS). It is, however, unclear whether the phone will come with a dual rear camera setup or have a single image sensor on the back. The promotional material also points to 43 LTE band support, which could make a global device. The leaked image gives away the Mi Note 5 price – the 4GB RAM and 64GB onboard storage configuration will reportedly go on sale at CNY 2,299 (approximately Rs. 24,400). This is slightly lower than the launch price of the Mi Note 3 that went on sale in China with a starting price of CNY 2,499 (approximately Rs. 26,500). It seems that instead of bringing the Mi Note 4 as the successor to the Mi Note 3, Xiaomi is ultimately set to bring the Mi Note 5 as its new Mi Note model. This move is similar to what OnePlus adopted at the time of launching the OnePlus 5 last year. Notably, Xiaomi also recently confirmed that it is skipping the Mi 7 name for its new flagship to favour the Mi 8 title. Apart from the Mi Note 5, Xiaomi is presumably planning to launch some other new models next week. 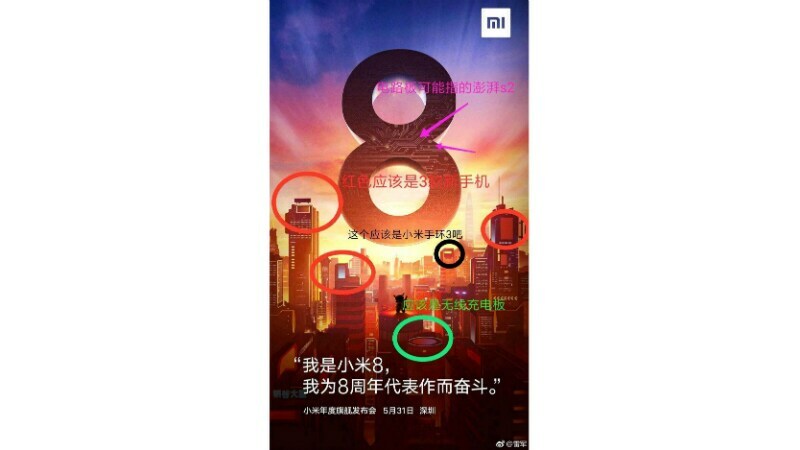 As spotted by folks at ITHome, some netizens have dissected the original Mi 8 teaser, suggesting the arrival of multiple devices at the May 31 event. The teaser apparently hints at more than two new smartphones as well as the Mi Band 3, wireless charging dock, and a new Surge SoC, which could debut as the Surge S2. The new mobile chip was first expected at the Mobile World Congress (MWC) 2018. But the company hasn’t revealed any information about its next silicon development. With multiple launches at a single event, Xiaomi is apparently following in the footsteps of Apple and Google that both often bring various new offerings under one roof.